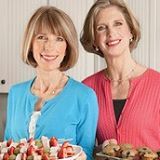 Liz Weiss and Janice Bissex are registered dieticians and are considered two of USA’s top experts on family nutrition. They’re on a mission to help busy families eat better. Liz has two boys and Janice has two girls, so they’re the perfect balance for providing advice to Moms of all ages. They are not only on a mission to help de-stress your dinner time, but also love to help their colleagues do well. Thing about Fruit and Vegetables first. Stock the pantry with healthy ingredients. Create a shopping list from a meal plan.